Vertigo is an extremely common symptom, but that doesn’t mean it is well understood, either in the medical community or by people in general. If you suffer from chronic or recurring bouts of vertigo, what should you know? We’re going to address eight important vertigo facts. Then we will give you a natural way to get your life back on track. What is vertigo? – Vertigo is related to false sensations of movement. If often feels like the room is spinning. However, even the feeling that things are tilting or swaying is also vertigo. So vertigo is the feeling you have after you get off of a boat and still can feel the waves of the ocean. It is also what causes some people who fall to say that it seemed like the ground was coming up to meet them. How long does vertigo last? – For most people, it’s just a few seconds to a few minutes. If vertigo goes on longer than 20 minutes, you may have a rare vestibular condition called Meniere’s disease (more on that later). In very rare cases, a person may deal with perpetual vertigo. It’s a symptom, not a disease – Vertigo can be a symptom of many different conditions. In fact, about half of people who go to the doctor for vertigo never find out what is causing the problem. 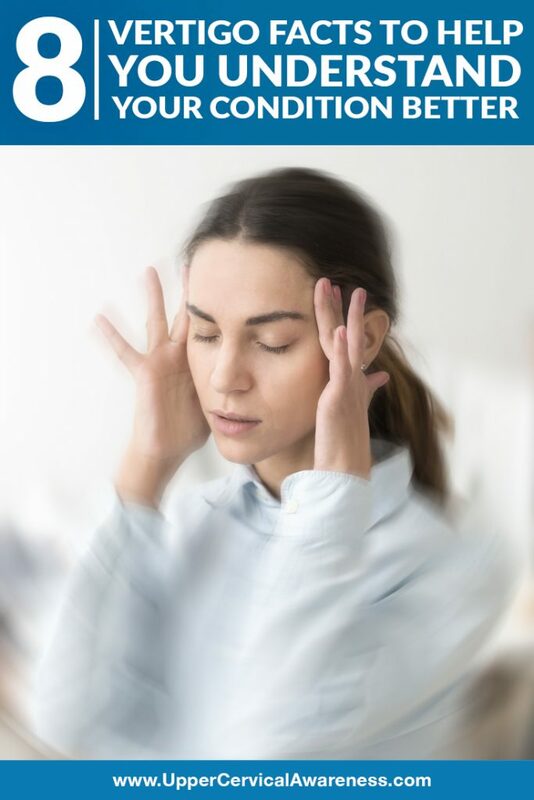 Many are simply diagnosed with positional vertigo, which basically means that vertigo occurs depending on how you move your head. Vertigo causes are divided into two categories – If vertigo is caused by an ear condition, it is called peripheral vertigo. If vertigo is caused by a neurological condition, it is called central vertigo. Vertigo can happen when you are lying down – Even if you close your eyes and can’t see the room moving, you may still have the feeling that you are moving. Laying down doesn’t fix the problem, but it can help you to avoid a fall, so it’s a good idea if you can get somewhere safe to sit or lay down during an attack. If you wake up with vertigo, it is a good chance that you will be diagnosed with positional vertigo. It could be Meniere’s disease – Meniere’s is considered a peripheral cause of vertigo. Bouts of vertigo are severe and can last anywhere from 20 minutes to 24 hours. Other symptoms include tinnitus (ringing in the ear), hearing loss, and a feeling of fullness in the affected ear (and less commonly in both ears). But more likely it is a migraine – This is a central cause of vertigo because migraines are a neurological condition. About 39 million Americans get migraines, and up to 40% can have vestibular symptoms like vertigo. So migraines are to blame for millions of cases of vertigo in the US alone. Some of your habits may be triggering the attacks – There are many ways that you can stop vertigo simply by making a few lifestyle changes. Everything from dehydration and lack of sleep to skipping a meal or failing to cope adequately stress may trigger a vertigo attack. Depending on the cause of your vertigo, there may also be some dietary adjustment that can help. Of course, if your doctor can’t find what is causing your vertigo, trying to find a way to cope with it can be hit and miss. One underlying factor that is frequently overlooked is an atlas misalignment. The atlas is the top bone in the neck. How does this bone’s position affect the systems of the body that have to do with balance and spatial orientation? Blood flow – A cervical misalignment can affect blood flow to the head. Whether blood flow is being restricted at the brain or the ears, vertigo can be the result. Brainstem function – The atlas surrounds the brainstem. Therefore, even the slightest of misalignments can cause issues in the central nervous system. As a result, this misalignment may be behind a number of the cause of central vertigo. Eustachian tube function – The eustachian tubes carry excess fluid away from the ears. If they can’t function properly, an excess of fluid may result in vertigo. Since the atlas is very close to these tubes, a misalignment can cause a lesion that may lead to peripheral causes of vertigo. As you can see, the atlas can play a role in many different vertigo causes. So if you suffer from chronic or recurrent vertigo, it just makes sense to get this checked out. If your vertigo is related to this common underlying factor, an upper cervical chiropractor can help. This is a chiropractic subspecialty that focuses on the atlas. Precise measurements are taken so that gentle adjustments can be administered. There is none of the popping or twisting of the neck that most people associate with a chiropractic adjustment. Since gentle adjustments tend to last longer, the body has the time it needs to heal. Can upper cervical chiropractic unlock your body’s ability to heal itself? Scheduling a consultation with a practitioner is a good way to find out. Since there are only about 3,500 practitioners of this subspecialty, you may have a little bit of a drive, but if you find genuine vertigo relief, it will certainly be worth it! This website’s search feature can help you to find one of our preferred doctors.